Virtual Graffiti, Inc helps you make smart IT buying decisions. We provide comprehensive product knowledge and outstanding customer support on all products we carry. We know you expect more than just a quote from your technology partner - and that is the Virtual Graffiti difference. Virtual Graffiti is one of the fastest growing IT solutions providers for business, government and education. Our unique approach to technology starts with comprehensive product knowledge and outstanding customer support, ensuring our customers find the right solution. We assist buyers of all levels of experience from the earliest stages of decision-making through product fulfillment and post-sales support. 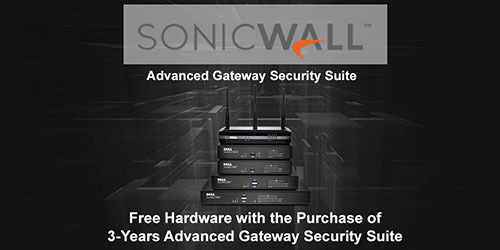 SonicWall's Promotional Tradeup! Free Appliance Upgrade with 3 Years of AGSS Purchase!